Want a truly professional sound library with lots of creative options to customize and create unique sounds for both cinematic and electronic music production? Then you will want to check out Gravity for Kontakt from Heavyocity. Gravity is an impressive sound library for Kontakt that Heavyoicty bills as a “Modern Scoring Tool”. It’s not cheap at $449. 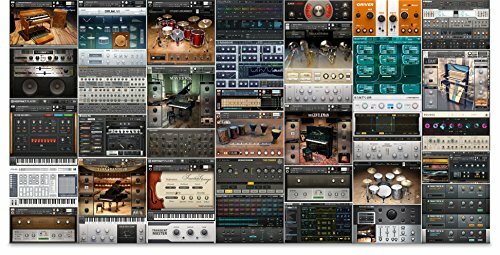 but Gravity is worth every penny, offering a huge and diverse sound library of ready to play instruments along with many creative sound sculpting options. While Gravity is certainly capable of making life easier for film scoring and soundtrack type work, my experience reveals that Gravity also offers a lot of promise for modern electronic composers looking to inject unique sounds such as gorgeous pads and soundscapes into their productions as well as cinematic style elements like powerful hits and risers. Gravity has a well thought out design with the kind of features and functionality that makes creating music fun. Gravity is much more than just your average sample library for Kontakt. It’s an advanced instrument that is easily one of the best scripted Kontakt products around. It’s an example of what most sound libraries delivered in Kontakt could be if only the developers took the time to utilize Kontakt’s many features and programming capabilities. Sounds complex… I know. But the good news is that Heavyoicty managed to create a sample library and instrument with Gravity that was both deep and complex with many desired sound shaping functions, yet keep it simple and streamlined enough to allow instant gratification, as you’ll see when you get to the section with my first impressions and my “unboxing experience”. Gravity comes right out of the box (download actually) sporting a huge number of ready made instruments that are perfectly sampled and mapped for instant playability. That’s a great accomplishment in itself, however I am most excited about the “User Interface” functionally that the scripting Heavyocity used to make Gravity offers sound designers, musicians and composers. Before I get into exploring the features and functions of Gravity, I would first like to share my initial feelings that I had when I first installed and starting playing around with this amazing sample library. Gravity was a digital download so there weren’t any boxes. The downloading, “upacking experience” and installation was a breeze. The size of the downloads were very large, but with a fast internet connection it didn’t take much more than a couple of hours. I went off to dinner while it downloaded so it was painless for me. Before downloading the actual files I followed directions and installed the Continuata Connect application on my Windows 7 PC. Continuata Connect watermarks the installation, unpacks all the downloaded .rar files and installs in a directory of your choosing. I used an external drive. You can put the Gravity files anywhere you want. They do not need to be in a specific place. After it was completely downloaded and installed I opted to delete all the install files. If you have lots of room on your hard drive it might be a good idea to keep those downloaded .rar files as a backup to reinstall in the future if needed. I clicked “Activate” and pasted in the serial number. The product was activated and I was off to the races. Gravity has an excellent 9 page “Gravity Quickstart Guide” on PDF (see PDF). There is also a full 45 page Gravity Manual on PDF. I glanced at the quickstart, which has an overview of the various tabs, but didn’t really get too deep into it. I was instantly impressed. Nice clean sound. Great look and feel. I immediately discovered that each “Instrument” (.nki) has “snapshots” (.nksn files) with sound variations. I like the way Gravity uses snapshots. I think it’s easier and more gratifying as compared to some other newer commercial libraries with snapshots that have just one main .nki instrument with all of the instruments loaded in the ‘snapshot menu” within the instrument (click the camera icon at the top of Kontakt to reveal snapshots by the way). Snapshots are relatively new and are starting to show up in more Kontakt sample libraries. They’re basically saved .nksn presets that are loaded within an .nki instrument. You can save your own snapshots within an instrument or load ones already saved. Snapshots were introduced in the Kontakt 5.4.1 update. You’ll find info in the Kontakt Help docs if you look for the “Kontakt 5 Manual Addendum”. I am using Kontakt 5.5.1451 by the way. I like this approach. Gravity has lots of individually programmed .nki instruments and lots of snapshot variations within each one. According to my count the Gravity library has 1,228 .nki instruments and an additional 945 .nksn snapshots. That’s a lot of variations available at the click of a button! And that doesn’t even include function “presets” which are available in many of the sound tweaking options within Gravity. The MOTION tab for example has a “browse” menu item with a complete a directory of folders with many rhythmic and tonal presets (.nka files for those interested) for creating motion using the sequencers. Very cool! I like to twist knobs and make my own sounds, but also love presets to make quick changes without having to learn how to get a specific result. The unpacking/unboxing experience was very positive. I immediately connected with Gravity. After an hour with Gravity I was feeling like there was so much more to explore! Kontakt libraries in general are a mixed bag as far as instant gratification and sonic exploration capabilities go. While many of them are getting better and better and offer better GUI experiences and more sound shaping capabilities, some of them fall flat and do nothing more than play a sample with a few basic controls. That might be OK if you simply need a very specific and/or unique sound (a sampled piano or an ethnic instrument for example). I myself am a sound designer type and rather than playing perfect emulations I prefer software instruments that allow me to shape the sound in as many ways as possible. I’m not saying simple instruments or emulations are bad, but in many cases they can be boring and have limited use. Gravity is not in any way boring. With it I feel that I can create nearly an infinite number of new sounds and variations. Gravity is refreshing because in a lot of cases, especially with commercial sample libraries and Kontakt instruments in particular, I find that I quickly run out of new sound capabilities shortly after installing and opening. I often feel like there is something missing and ask myself “is that all there is”? Not with Gravity. After 30 minutes of my initial exposure, I knew I was only scratching the surface. There was so much more to explore and I kept getting surprised with new tweaking options and wonderful sound. After playing just 3 “pad instruments” I already felt like I had a satisfying sample library experience. The fact that there are additional “snapshots” in each .nki instrument, as well as all of the sound editing parameters and presets makes creating music with Gravity a very full and rich experience. The learning curve is very small and the tweaking possibilities are immense. The fact you can add motion so easily and in so many different ways makes this a really fun experience. That’s without even looking at the manual yet. OK – so now that I shared my notes of my first impressions from the unpacking experience it’s time to dive into Gravity a little deeper. Gravity has different GUI’s depending on the type of instrument opened. There are 2,200 sound sources in all with 815 snapshots and 325 motion presets. There are “designers” for Hits and Risers that allow easy customization. The Pads section of Gravity is my favorite part. The GUI utilizes a 3 sample layering engine for each pad instrument. Each pad instrument .nki in Gravity is basically a hard wired combination of 3 layers of samples in which you can individually adjust many parameters including level, pitch, attack, decay etc. The layers do not allow loading of samples, so the ones loaded in each instrument are the ones you have to work with. Loading new samples in each layer would have been a nice option, but I understand that would add complexity to the process. Maybe not having this option actually makes it easier for composers scoring films and such to get good results faster. Also with 780 pad instruments they already offer a huge amount of combinations. So I can get along without being able to change the combinations in the layers. From what I can tell it appears that all or most of the instruments have single samples for each layer, however this is not a problem. It is not even noticeable unless you pop open the hood and check out mapping in Kontakt. In this case I do not see how multisamples would have made the sound better. I do like the fact that you can edit the parameters of each layer (CH1, CH2, Ch3) individually or LINK them so the changes affect all of them. The EQ and Filtering tab is very well laid out and allows a lot of options to sculpt the sound. That tab also has a Master EQ that when clicked reveals a 4 band EQ for all 3 CH combined. TFX Tab also has some nice advanced functions hidden in there. I must say Heavyocity did a splendid job with the GUI making it functional for quick tweaks yet offering “easter egg” type advanced options if you dig around and look for them. The manual is very detailed and offers a wealth of info on each and every function. I was immediately struck by the MOTION TAB and all the nice options and presets it has. The Motion Tab not only offers randomize but also some nice preset settings like ramp up, ramp down x1, x2 etc. These are great for the composer who needs an instant change without the need to program the sequencers. The PLAY arrow in the MOTION tab turns the motion on and off. Nice. Signal and Orbit have been praised for their motion abilities, but Gravity too has a nice set up to quickly and easily add movement to sounds. I keep noticing little gems as I play around. Such as the “motion play arrow” also being available at the bottom in all the tabs. That’s smart. You can easily turn motion on and off regardless of what section you are working in. Plus the way they have designed the GUI Interfaces in KSP (Kontact Scripting) doesn’t distract or take away from the main focus of each tab. All knobs and functions are nicely laid out. Even after initially messing around without the manual, I was instantly impressed with the Gravity experience and can see I will have a nearly endless amount of exploration possibilities when I have more time to try different “instruments” and learn about the advanced features with the manual. Wow. The hits are amazing and really fun to compose with. I already have Heavyoicty Damage, Evolve and Evolve Mutations so I am already familiar with these kinds of Heavyocity styled epic cinematic sounds, but must say I am totally blown away with what Gravity offers. While I’m not actively involved in scoring films, I must say after playing around with the hits and risers I am confident I could pull it off with Gravity in my toolkit. I recorded a few cinematic style segments and they sound amazing. And with very little effort required! It’s like instant incredible soundtrack… instant suspense… big blockbuster vibe… huge surreal ambience with tension and impact. The sounds are all there – just pick the best ones and play. The samples are diverse and spread out in kits across the keyboard. They’re recorded brilliantly. Creative filtering of differing frequencies in the various hits makes the impacts that much more effective. I’m sure working composers of film soundtracks would have more to offer to the discussion, but from my vantage point I’d just like to say that being able to load up instruments with hits and impacts such as those in Gravity makes it fun and easy to create dark moody cinematic segments of sound. I must admit I don’t use risers in my music very often. They are effective in scoring soundtracks and for this Gravity has a robust Riser designer making it easy to customize the sounds. There is no doubt film composers would love Gravity, but what’s interesting to note is that it is also accessible for modern music composers of all types to use and take advantage of. I can easily see myself using Gravity in electronic compositions of all types. So – whether you are a soundtrack, game composer or moderm musician looking for a unique pallette of diverse high quality sounds I think you would be thrilled to have Gravity in your arsenal of tools. I know I am.